Octavix, Fuzz pedal from Electro-Harmonix. 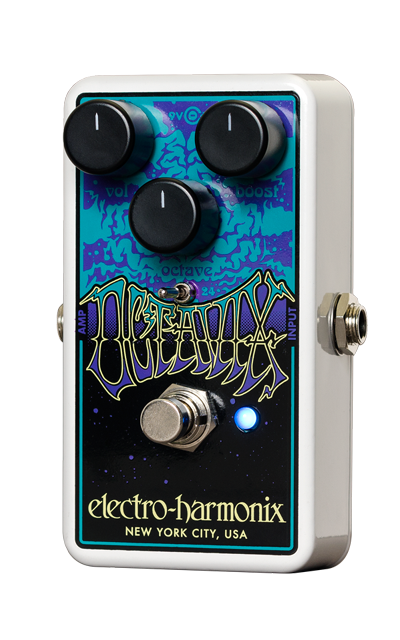 Many of you noticed in the Electro-Harmonix demo room at NAMM 2015 the new Octavix effect. Here are the details of this new stompbox. The EHX Octavix reproduces the classic octave up fuzz effect in a Nano format pedal. You can control the output level, fuzz amount (Boost) and upper octave volume (Octave). 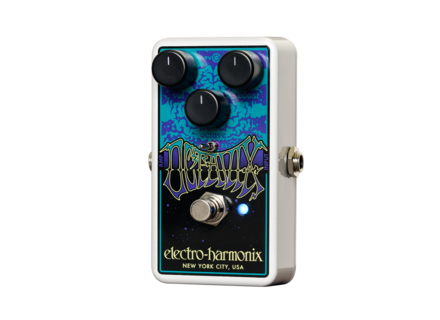 Electro-Harmonix also installed a mini-toggle that allows for selecting the voltage for the entire circuit between 9V and 24V (power rails) ; at 9V you’ll get a classic tone and at 24V the sound is thicker and the octave richer. The Octavix is equipped with a LED and true bypass. It’s powered by a 9V battery or optional adapter. [NAMM] Jackson Misha Mansoor Juggernaut HT Periphery’s guitarist signs in 2015 his first Jackson guitar, the Misha Mansoor Juggernaut HT, which will be available in 6 and 7 string versions. [NAMM] Limited Edition Vox VT20+ Classic Vox will offer this year a very limited edition of its VT20+ modeling combo for guitar in a special Classic finish. [NAMM] 4 Keeley effect pedals Robert Keeley opened the pre-sale of four new effect pedals for guitar with special prices and a gift, a special operation for NAMM.